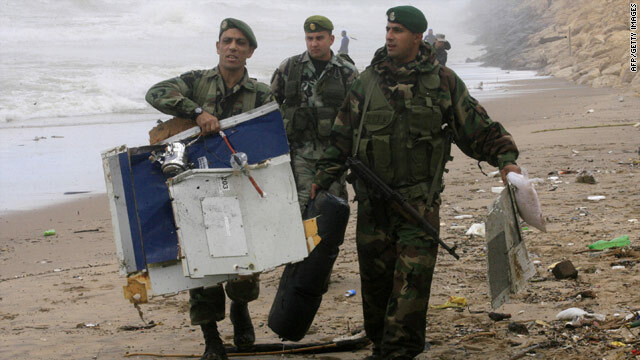 Lebanese troops carry the debris of an Ethiopian Boeing 737 that crashed into the Meditteranean. Beirut, Lebanon (CNN) -- International search teams combed the Mediterranean Sea for signs of life on Tuesday, a day after an Ethiopian Airlines flight went down off Lebanon, authorities said. Ninety people were aboard early Monday when the plane disappeared from radar shortly after takeoff. The Lebanese military reported on Tuesday that 14 bodies had been found -- nine fewer than an earlier count. Confusion early in the search led to double-counting, they said. No survivors have been found. Ethiopian Airlines Flight 409 left Rafik Hariri International Airport in Beirut about 2:30 a.m. and was headed to the Ethiopian capital, Addis Ababa. The search included aircraft from the United States, Britain, France and Cyprus. The U.S. military sent the USS Ramage -- a guided missile destroyer -- and Navy P-3 aircraft in response to Lebanese requests for assistance, according to U.S. defense officials. Authorities did not immediately know the cause of the crash. "We don't believe that there is any indication for sabotage or foul play," Lebanese President Michel Suleiman said Monday. The Boeing 737-800 had eight crew members and 82 passengers -- 51 Lebanese nationals, 23 Ethiopians, two Britons and citizens from Canada, Iraq, Russia, Syria, Turkey and France -- when it went down, the airline said. The plane crashed about 3.5 km (2 miles) west of the town of Na'ameh. Na'ameh is 15 km (9 miles) south of Beirut. Government-owned Ethiopian Airlines is one of the largest carriers in Africa, serving Europe and three other continents. The airline has experienced two fatal crashes since 1980. In November 1996, a flight bound for Ivory Coast was hijacked by three men who demanded that the pilot fly to Australia. The pilot crashed while attempting an emergency landing near the Comoros Islands off Africa. About 130 of the 172 people aboard died, according to published reports. And in September 1988, a flight struck a flock of birds during takeoff. During the crash landing that followed, 31 people of the 105 people aboard died. CNN's Cal Perry contributed to this report.